I dedicate this to my good friend, L.F.
She was the one who brought this great juice into my diet. She also makes sure both she and her family drink the juice daily. It tastes a bit sour and a little sweet. 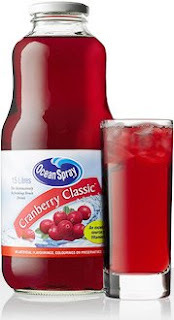 Substitute your KDD's mango, cocktail, apple in your fridge with Ocean Spray's Cranberry Juice(found in Sultan Center) and KDD's Cranberry Juice(which I like better than Ocean Spray). Some people opt for a more "convenient" way of intaking the fruit by taking cranberry juice capsule twice a day. 1- Highly effective in the treatment of urinary tract, bladder, and kidney infections. 2- It's nutrients help protect you against heart disease. 3- Cranberry antioxidents help protect you against cancer (especially ovarian cancer)! 3- Prevents and aids in the breakdown of kidney stones. 4- Combats against plaque and gum diseases. 5- Cures colds and flues (it has vitamin C). 6- Strengthens bones and teeth ( its a good source of Calcium). 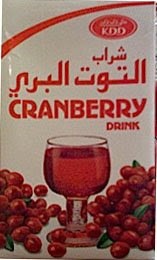 Recommended intake of cranberry juice per day: Start with at least 1-3 glasses (500ml) thats equal to two KDD juices. I tried it and doesn't taste bad. Thanks so much!